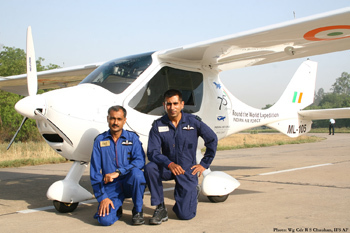 A Flight Design CTsw flown by Indian Air Force Wing Commanders and Squadron Leaders Rahul Monga and Anil Kumar completed a round-the-world flight in 79 days involving 19 countries. This is believed to be a new world record for this class of aircraft. The CTsw was equipped with Dynon’s EFIS-D100 and EMS-D120 avionics. It’s exciting to see enterprising individuals undertaking global conquests in Experimental and Light Sport type aircraft. Dynon congratulates Rahul Monga and Anil Kumar as well as the folks at Flight Design for this great achievement.